Wow ! it’s already been a month since my last post, which is way over my target of a weekly post but my excuse, if I can get away with one, is that it was family holiday season and we went again to Dubai – the kids and wife insisted. Last year I wrote a summary on drinking coffee in Dubai, which was really like a summary of drinking coffee in one mall. This time, I tried to broaden my horizons by visiting a few more malls but still failed to visit some cafes outside the mall perimeter – next time God willing. Following on from some advise given by a coffee pro – “don’t bother tasting espresso style coffee from coffee chains because it is always going to be badly prepared”, I initially only ordered what could be called Americanos and just “normal” filter coffee. For a while it satisfied my caffeine thirst, but then I thought, it’s been over one week without espresso and decided to risk it. A few pointers before telling you about my experience. Firstly, I only visited cafes with semi-automatic machines and not pure automatic ones (witness Starbucks), where the barista just pushes a button and hopes for the best. Secondly, and I was called a snub for this by my wife – insist that the barista cleans the machine before making your coffee. Usually, old coffee is left in the portafilter, emptied and without cleaning the old dried stale coffee, what is supposed to be fresh coffee is ground and placed into the portafilter before placing into the group head without cleaning the machine – Yuk! On this occasion, I insisted every time that the barista empty the old coffee, flush it out with hot water and also clean the group head with hot water. Finally, I insisted that they tamp the ground beans. You would think that with these key pointers, some sort of espresso will come out, but sadly this was not the case – why ? I think it falls under the best known two classical mistakes – serving non-fresh coffee with an inaccurate grind setting. From the taste of the majority of the coffee I had, freshness was compromised by far, because, even if the coffee is fresh and the grind setting is inaccurate, you will smell the aroma and the coffee, although bitter in taste, will still have some sort of fresh taste. I didn’t even go there with milk based drinks because badly frothed milk is usually burnt and gives me indigestion – Snubbish ? No ! I’m just trying to get what I paid for and not mess up my stomach. Anyway to the shops. One thing I noticed now is that some more of the cafes have now started trying to tamp. At the Tea Merchants, Burjuman Mall, I noticed a La Marzocco machine and an expensive Mahl Konig Grind-on-Demand coffee grinder, but sadly, as you can see from the picture, after insisting on cleaning the machine, etc the crema was still very thing and lasted about a minute but the taste told me more – not very fresh. The baristas, however, were very amused by my tips on cleaning the machine and tamping the coffee. Having looked down on coffee chains and there are everywhere, I decided to try a popular one in Dubai, who boasted about the “Italian taste”, so I went to the aptly named Barista – which is actually an Indian coffee chain. At their shop in the Dubai Festival City (nice shops and water way) I was impressed by their preparation techniques and most of all by the taste – it did have an “Italian taste” after all, as they proudly displayed that their coffee is roasted in Milan. In all, I told them that their espresso was the best I had tasted in Dubai. I also caught, surprisingly of all, one of the baristi having a go at latte art… hmmmm ! 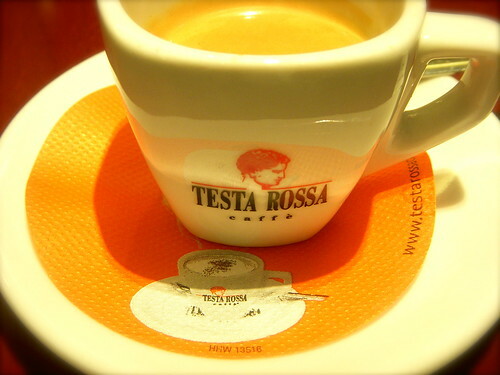 One more success story was the espresso I had on my last day at the Dubai International Financial Centre in the Testa Rossa Caffe. I decided not to fuss about how the coffee would be made – I was too hungry to run over to the bar. However, perhaps my reputation had preceded me as I watched the barista, clean the machine, flush out the group head, grind the coffee and tamp. 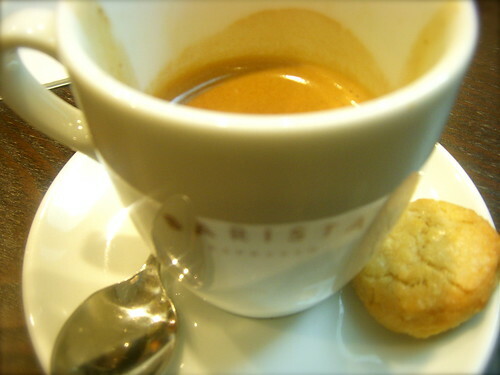 I was impressed and although the coffee had some crema, the taste was not as sharp as the one I had at Barista. 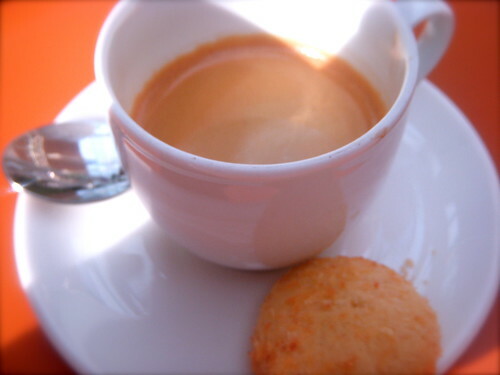 I’m still looking for real crema and that authentic espresso taste in Dubai – land of the malls, flashy cars, famous hotels and indoor ski slope, but that will have to be on another occasion God willing if I return. I’ve just got to leave you with one incident – On another occasion on this trip, I decided to try an espresso at a Dubai based coffee chain and after warning the barista that I write on coffee, he boasted that his colleague could make really good espresso, so I thought why not. In chatting to him, I went a step further, “so ! what sort of coffee do you use in your blend and where is your coffee from ?” “Canada” was the reply and I thought “Oh no it doesn’t, they don’t grow coffee in Canada” but I decided to keep that embarrassing revelation to myself and just smiled – I then knew I was in for a surprise. Needless to say my suspicions were confirmed and that is why I have a story and not a picture of what was advertised as an espresso. 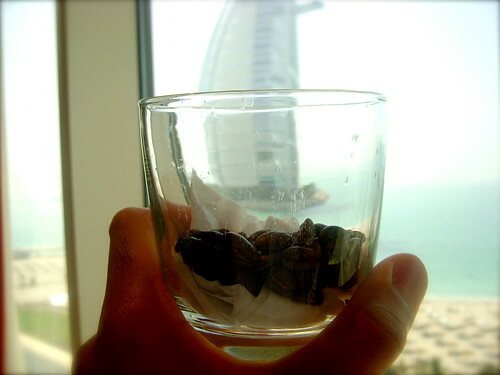 I think they need really good coffee in Dubai to match their plans to become one of the top destinations in the World…. still looking.